Home > Attend > Events > Press Release: The Luther Sculpture. DETROIT, April 30, 2018. The new bronze sculpture is most impressive at dawn. That’s when a rising sun illuminates the deeply etched face of a young Martin Luther as he boldly nails The 95 Theses to an unseen church door. Above him, a spray of 95 doves rises triumphantly into the sky. When this remarkable 12-foot-high likeness of Luther was unveiled in front of Historic Trinity Lutheran Church on April 29, it not only represented one of the most important events in the second millennium A.D. – the launch of the Reformation in 1517 and the accompanying renaissance in art, music, literature and religion that followed – but also a growing urban congregation’s hope for healing, faith and renewal in the heart of a long-suffering city. Not that this sculpture didn’t arrive without a fair amount of dogged determination and consternation. When Rev. 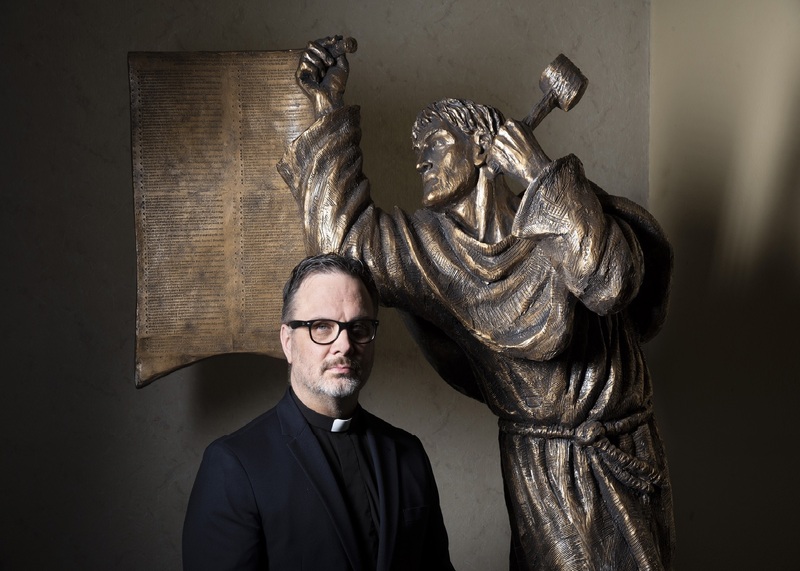 D. Lee Andrzejewski, head pastor at the landmark neo-Gothic cathedral, dedicated the Luther sculpture with a short sermon and a prayer, it brought an arduous three-year effort to a close. Along the way, Andrzejewski had navigated through artist renderings, contracts, historic commission approvals, and city permits, fundraising efforts, international customs, seasonal delays and, finally, an unexpected road trip to Chicago, all to insure that the statue found a permanent home at 1345 Gratiot Avenue in Detroit. Historic Trinity’s newest religious installation is an imposing piece of artistry and an engineering marvel. The sculpture was designed and sculpted by Canadian figurative artist, Timothy Schmalz. Originally inspired by the 2015 dedication of the Luther Square in Rome, Schmalz created five Gospel-based sculptures installed in some of the most significant sacred spaces in that city, including the Vatican, St. Peter in Chains, St. Paul’s Basilica and San Lorenzo in Lucina. “This sculpture is a tribute to that momentous time in Christian history that still echoes to this very day, a moment that demonstrates how one man’s faith, devotion, and courage can change the very course of the world,” Andrzejewski said. “Martin Luther fought for what he believed in and stood unmoved, even in the face of profound opposition – much like the city of Detroit itself. Andrzejewski launched the acquisition campaign with a simple appeal to his parishioners: Would 95 members donate the money needed to purchase the sculpture and fund the base needed to install it? Within a matter of months, the pastor had the necessary commitments and work to bring the statue to Detroit began in earnest. During the period that followed, Andrzejewski became the crucial project lead. Martin Luther, a German professor of theology as well as a composer, priest and monk who lived from 1483 to 1546, was the seminal figure of the Reformation. The very act of composing 95 theses that debated the validity of indulgences in the Roman Catholic Church launched the Reformation, established the Lutheran faith and resulted in the translation of the Bible from Latin into German, a common language of the people. Schmalz’s sculpture captures the very moment when Luther delivered his treatise to the church. But in an artistic inspiration, he added a six-foot-high arc of doves to the scene. The weight of the 95 doves, canted out over the base of the sculpture, required that Historic Trinity engineer a foundation for the statue that extends several feet deep below the sidewalk. Historic Trinity was founded in 1850 in the Eastern Market District (originally called “Germantown”) of downtown Detroit. The present church, erected in 1931, was designed to replicate a 16th century Pierand-Clerestory Gothic cathedral and is a national, state and local historic landmark. The current cathedral has been completely restored during the past 20 years to highlight its magnificently carved wooden altar panels and Narthex screen, hundreds of stone carvings, brilliant stained glass windows, hand painted ceilings and Pewabic Tile floors. The church installed another Schmalz sculpture, “Homeless Jesus” outside its front doors in 2016. The artist’s Matthew 25 series has been placed in more than 20 historic cities including Rome, Westminster London, Madrid, Singapore, Capernaum, and Santo Domingo. The courage and passion of Luther has inspired such notable civic leaders as Rev. Michael King, Sr., pastor of Atlanta’s Ebenezer Baptist Church in 1934, who was so moved by the Reformer’s ministry that he changed his name, and that of his five-year-old son, Michael, Jr. to reflect this admiration. His son would from then be known as Martin Luther King, Jr.